This is a bridal album page design features the bride and grooms romantic photo session following there wedding ceremony at the house of refuge in stuart florida. 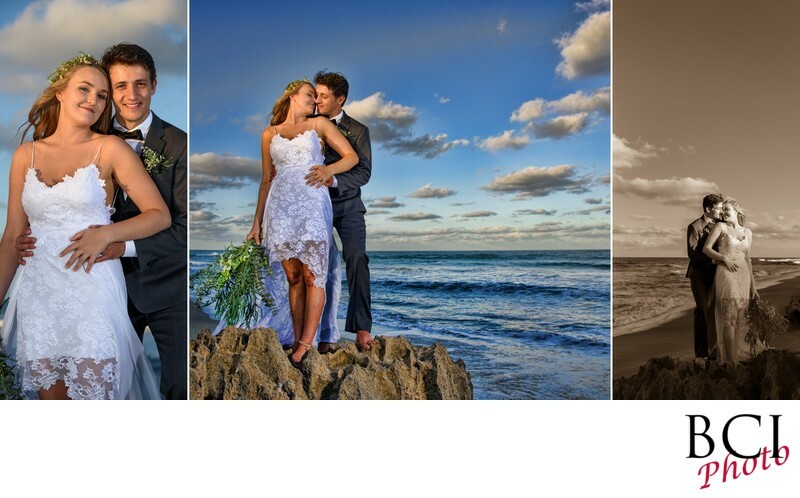 One of the things we love to do with our wedding album designs, is to layer the images such that one feature image becomes the background and smaller highlight images are placed around it. In that way, we direct the eye through the page much the same way that a film maker directs your attention thru quick cutaway shots to various details all tying into the same theme. Often, some themes may be combined on one album spread. This can be done to break things up, or if there are space requirements that make devoting an entire spread to one theme less than practical. Also on display for these images is our professional on location portrait lighting. Folks tend to want to see the oceanfront scenery they paid to be at in their photos. The only way that can be done, is to augment the existing light so that the light levels on the subjects match the light levels in the sky. in other words, you cant do this with natural light only. Dont be fooled by those professing to only shoot natural light only. Sure sometimes that can look great, but almost always....it can be improved with the addition of a wee bit of help. Here you can also see what a fantastic wedding venue the house of refuge musuem really is. Just a magical look down the beach for sure. With possible ceremony locations on either side of the actual museum building itself, the brides have lots of choices. The patio area within, does require tenting just to be safe as you never know what the weather will give you on any given day. Often the surf is high and the patio can get soaked from the ocean spray. (been there done that). Similarly, there is no place to run in the event of rain. So just do yourself a favor, get both tents, and order the sidewalls just to be sure. Its still a very affordable venue to start with all things considered.